Hooray for Christmas Cookie Season! The holiday season is great and all, but cookies are the real reason for my excitement this time of year. It’s what gets me out of a warm bed to face a cold day. If there were some sort of cookie-centric holiday in February (Valentine’s Day cookies aren’t enough of a thing, don’t you think? ), I wouldn’t mind the winter so much. Maybe. Probably not. Let’s kick off the cookie-baking season right: with a ridiculously quick and easy one bowl drop cookie that tastes as decadent and rich as you would expect from cookie with “double chocolate” in the name. 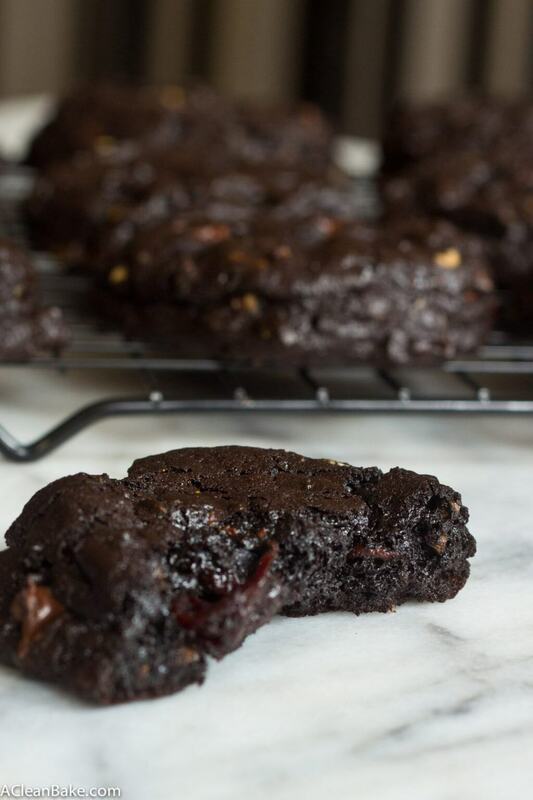 These double chocolate cherry oatmeal cookies have a crisp outer shell that is SO satisfying to bite into, and contain a soft and gooey center that melts in your mouth. 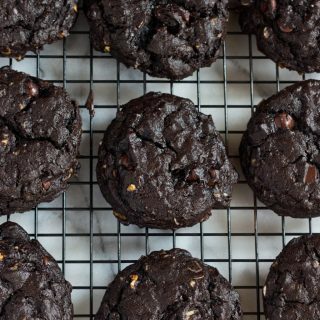 The chocolate chips are creamy and the dried cherries and oats are chewy; the sweetness of the chocolate chips and cherries balances out the super dark chocolate flavor of the cookie dough itself. These cookies are, in sum, everything you need this time of year. Preheat the oven to 350F. Cover 2 cookie sheets with parchment paper or nonstick pads and set aside. In a large, microwave-safe mixing bowl, combine the almond butter, regular butter (or oil) and honey and heat on high for 30 seconds until the honey is very runny and the butter is about half melted. Use an electric mixer to mix until the butter is completely melted and ingredients are combined. When the butter is melted and the mixture has cooled slightly, beat in the egg and vanilla, followed by the salt and baking soda. Slowly incorporate the cocoa powder. Put away the electric mixer and use a spatula to fold in the chocolate chips and cherries. Use a spoon or cookie scoop to divide the dough into 10 2-Tablespoon balls. Space them evenly on the prepared cookie sheets. Bake for 15 minutes or until tops are crisp. Cool cookies on sheets for 10 minutes before transferring to a wire rack to cool completely. If your almond butter is unsweetened, you may want to add an additional Tablespoon of honey. For a lactose-intolerant variation, use vegan butter (e.g. Smart Balance or similar product), shortening or coconut oil as the fat and a dairy-free brand of chocolate chips. For a gluten-free variation, make sure you are using oats that specifically say “certified gluten-free” on the package. For a vegan option, use the lactose-intolerant ingredients above, plus an egg replacement such as EnerG or flax eggs. You may need to increase your baking time to compensate for the added moisture that egg replacements usually contain. 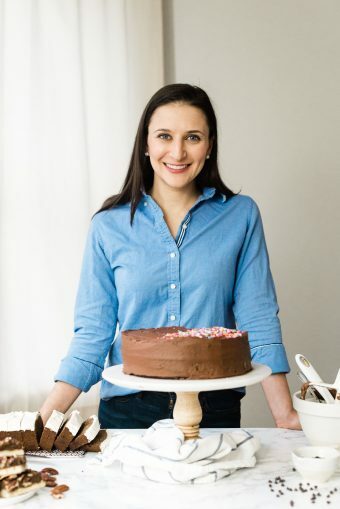 If you are not serving these immediately after baking, store them in an airtight container at room temperature for up to 4 days, or in the freezer for up to 3 months. The recipe is just a click away. Today I am guest posting for a friend who is tackling her first week back at work after maternity leave, and needed some time to get back into the swing of things. 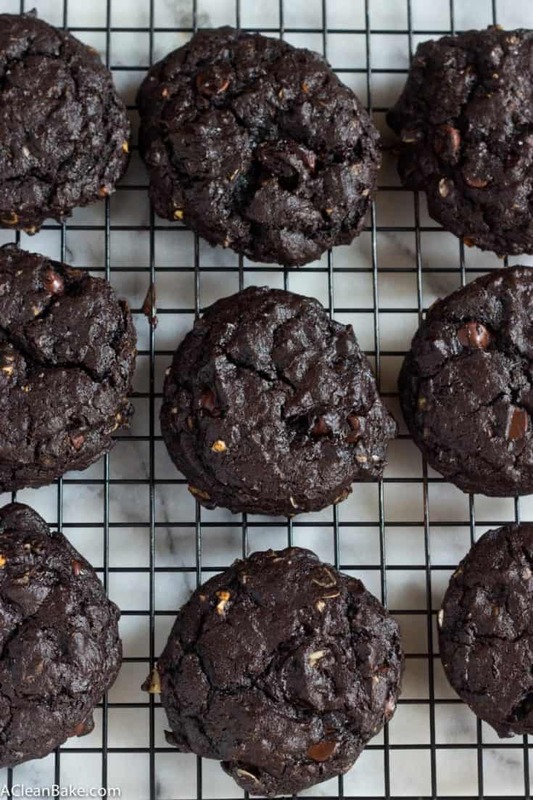 So, get the recipe for these can’t-miss cookies over at The Lean Green Bean. And don’t forget to say hi to Lindsay while you’re there! OMG!! These cookies are amazing… chocolate and cherriesare a fab combination. . love it love it… hopping over to check out the recipe! ! Um checking out this recipe ASAP. These look SO GOOEY and chocolately. YUM! Also – let’s make up our own cookie based holiday in February. Because I couldn’t agree with you more – cookies are everything. Yes! More cookies are exactly what February needs. Roses are lovely and all but cookies are just so much better! Love that flavour combination – yum! Yum!! These cookies look delicious, Nora! Love the cherry & dark choco combination, and I agree cookies are one of the best things about the holidays (: Definitely will be checking out The Lean Green Bean! where is the link? I could not find it.